LMAC has photographed literally over 1000 weddings over the years. LMAC is very experienced at posing people to bring out the personalities of any group. It's a big part of being a wedding photographer. 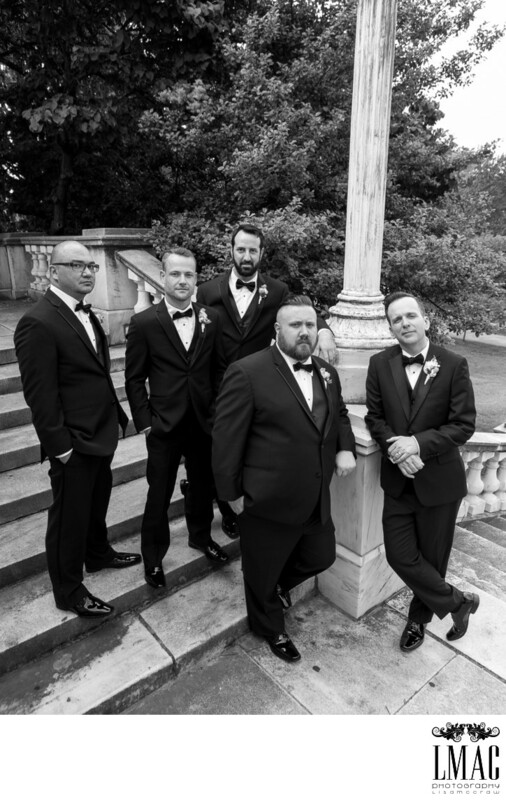 Some groomsmen are not really into the photos so we do our best to make it a little more fun for them. This is from the wedding of Maria and David. Maria and David had a gorgeous wedding with the ceremony at Church of the Gesu in University Heights, Ohio and their wedding reception at the Embassy Suites in Beachwood, Ohio. This photo location is one of the most popular in Cleveland, the Cleveland Museum of Art. The Cleveland Museum of Art offers both indoor and outdoor photography options. The Wade Oval area is the most commonly used part of the Cleveland Art Museum for photography. Location: 11150 East Blvd, Cleveland, OH 44106.